We are a sacred order, bringing into being a harmonious and loving world through the practice of meditative, compassionate awareness and mindful stewardship. 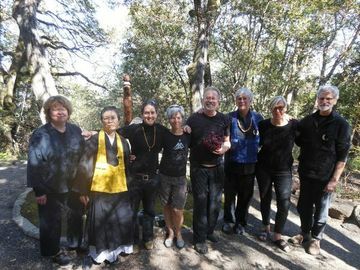 The purpose of Stay Dog Zen is to provide a vehicle and specific practices for supporting individuals on their own unique path of “Waking Up, Growing Up, Cleaning Up, and Showing Up” in all dimensions and quadrants of their lives. 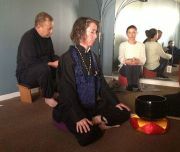 Hollow Bones is an American Rinzai Zen School. This school provides a clear, open channel for awakening our body, mind, and spirit. This school is specifically tailored for contemporary Western culture. It is Zen stripped bare and separated from its Japanese cultural identity. It is Zen investigated, understood, and practiced deeply. It is a pragmatic, non-sectarian spiritual discipline and way of life that awakens us and transforms our lives. From this perspective to consider Zen a religion is to miss the point. This sangha is led by Ekai Joel Kreisberg, Choan Tim Cook, Bodhi William Prince, and Yoshin Dave Klaus, priests in the Hollow Bones Rinzai Zen Order. We are students of Junpo Kando Denis Kelly, Abbot & Founder of Hollow Bones & Mondo Zen (mondozen.org), and Doshin Hanna Michael Nelson, Abbot & Founder of Integrating Zen Center, Inc. (integralzen.org), and Fudo Myoo Roshi, a Qigong Master, (http://www.qigongdharma.com/). We hold Zen meditation & services, qigong practice, as well as Mondo Zen workshops & retreats from locations in Berkeley and throughout the San Francisco Bay Area.